Mid 2005 my friend Bill was visiting friends in Australia. Susan his twin sister (not really, but might as well be) is breeding bunnies and showing them and winning prices. So Bill asked me if I knew of a good pattern of a bunny or a hare, preferably in a medieval setting. 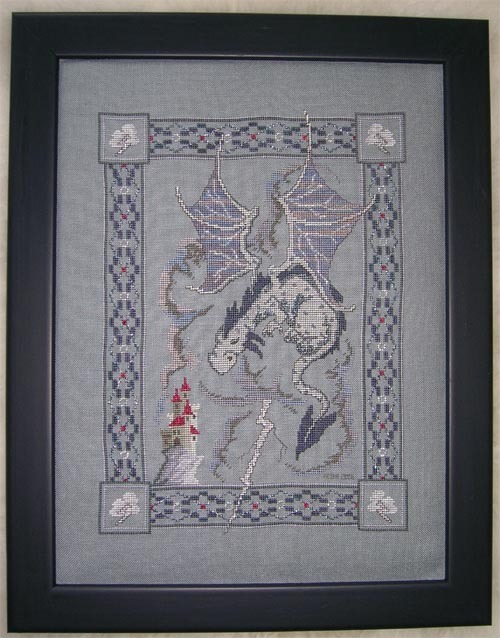 I browsed around a bit and discovered Beth Russell Needle Point. 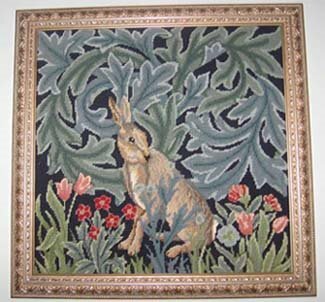 There I found a kit that is part of a tapestry by William Morris with a hare, which I liked. I showed that to Bill and Susan and they really loved it and then they asked if they would pay for the kit, would I be willing to stitch it up as a seat cover for Susan. I've never did needle point before (I'm a cross stitcher by heart), but I'm always willing to try something knew, so I said, sure, yeah, why not. The kit was ordered and received and I immediately went to work. As I said, never did any needle point and obviously had no proper frame to stitch it in. So I stitched it in hand, which proved to be easier said than done. Especially, in the later stages, there was quite a bit to hold in my one hand, while stitching wih the other. As it was to be used as a seat cover, I stitched it with the continental stitch (I know, I should have used the basketweave, but that's all part of live and learn). It took me a good 6 months to finish and shortly after x-mas I send the somewhat askwed hare (I tried to block it, but I didn't manage to get it straight) off to Australia. 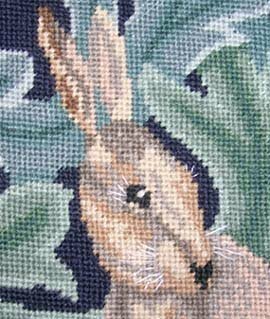 Susan changed her mind, though, and instead of a seat cover, whe found somebody to frame it (and straighten is out) and now the finished hare is on her living room wall. Last night I went and saw Superman Returns. Even though this movie was released in the US end of June, it won't be showing in Germany before the end of August. I don't know exactly why they wait so long. In the last couple of years, the release dates all over the world got closer and closer together in order to stop pirating. My best guess would be that this time they waited a bit in Germany, to prevent getting caught in the World Cup frenzy - but why then wait more than six weeks? Anyway, France, luckily for me, is not that far behind (it started second week of July) and so I went to see it here (with French subtitles). It is very noticable that half of France is on vacation. Usually, when I try to get from here (20km south of Paris) to Paris itself, I need at least 90min if not more, due to all that traffic. This time, though, I manged to get to the theater in less than an hour. I got to the theater with plenty of time to spare and managed to dip into Loisirs & Création a craft shop a few steps away from the theater. I've bought two hanks of DMC color variation threads and a very small Lanarte kit. The movie: I really liked it. It felt a lot like the old Superman movies, though of course the technology has been updated. It amazing how Brandon Routh looks like Christopher Reeves. He has an absolute charming smile and the acting was pretty good too. I also liked Lois Lane - there were a couple of Superman versions where that woman only got on my nerves. It took me until five minutes before the end before I realized that the guy who played her finace was the same who played Cyclops in the X-Men movies - which obviously proves that the glasses/no-glassed routine that works so unbelievably well for Clark Kent/Superman is in fact working. The FX were mostly very good (except for some cape action that didn't look too real for me) and the rescue of the Space Shuttle / airplane was very, very cool. Buidling on the good old Superman theme music by John Williams was a very smart move - I have to see if I'm going to get the score eventually. The story was true to the comic books - who cares about physics when he can have a superhero to play with? And only the old Lex Luther could have come up with the evil master plan for this installment. So, all in all, I was very happy, and I will go and watch it again when it finally comes out in Germany. If there's one airport I don't particularly like then it's Paris' Charles de Gaules airport. Why, somebody explain to me, does it take less than an hour to fly from Frankfurt to Paris, but over two hours to get my luggage and the rental car? The cap was when the elevators (or is that lift?) I needed to take to get to the car park had some problem and a throng of people tried to get in. It looked to me like two out of the six elevators didn't work (at least their doors never opened while I was watching). If I had had a clue where the stairs were I would have taken them, but I couldn't find them. Of course, after I finally got inside a cab, some lady insisted on pushing her (almost empty) luggage cart in next to the one that was already crowding the place, making it almost impossible for me to leave the cab when my floor finally came. In Frankfurt there must have been some sort of conference or meeting for the Jehowa Witnesses. There were hundred people with purple name batches with the slogan 'Deliverance is at Hand' in at least four different languages. The line for the US check in counters was the longest I've ever seen and I feel sorry for all 'normal' people who wanted to go to the USA this morning. Half of my flight was from the same group - most catching a connecting flight to the USA in Paris. I watched the pilot of 'Eureka' last night. Hmmm, I'm not so sure so far. I liked the female deputy for some reason, though normally I can't stand the 'I'm tougher than any guy' types. I give it some more chances and see how it develops. Took me roughly three months, but as it was 'only' my travel project, it didn't get that much time devoted to it. I stitched it pretty much as designed with recommended threads and fabric. Only thing, I left out the beads in the corners. I'm not to crazy about beads to begin with and they don't add much to the design for me. I found a good frame, but repainted it to match the color better. And I need to mount it properly - just need to find a good mounting board I can use. I've started to stitch Dance of the Bumble Bee by Bent Creek as a quick take with me project yesterday, but going now to prepare anything for Voyage at Sea (a kit form the Petites Gold Collection by Dimensions) to take with me next week to my trip to France. I've never stitched on a 36ct linen (as I'm going to swap the aida in the kit for some Edinburgh linen) Have to see how it goes. Shepard: You're a genius, Rodney. Rodney: Yes, I know... but I didn't do anything. I've driven home last night from Dresden back to Frankfurt (got a dentist's appointment today). The last couple of days it got hotter and hotter. I left Dresden to 38degree Celsius!!! Thank God I've got AC in my car. At least the heat is dry - humitity would be the killer now. Around Eisenach I saw lightning ahead. I do love lightning. During a thunderstorm I could sit at a window and just watch it. Now, with the new appartment, I've got a great place to do it. From my bedroom window in the fourth floor I can see all over Langen - only so far I didn't have the oppertunity. The rain lastet only for 10 min or so, but it cooled the air by a good 20 degrees. That is until 50 km later, when it was back in the 30ies. The coolest about a thunderstorm in the late afternoon/early evening is when the sun comes out again and you can see a rainbow. There was a pretty good one and when I stopped for a short potty break, I could see both ends of it, though not the full half circle. I tried to take a picture, but it didn't come out that great. Anyway, a day when you see a rainbow, is not a lost day. So, I'll try an include a McKay quote every week or so. McKay: Maybe... Earth'll probably mount some kind of defence... In which case I imagine death would be instantaneous. Unless we're trapped on a deck and on fire or something, then we'd be burned alive. Well, burned alive or suffocate. I wonder what'd be worse: being life-sucked by the Wraith or, or, burned alive. I honestly couldn't consider two worse options. Isn't he just a ray of sunshine ...? I've have been pondering starting a blog for some time, mostly to show of my stitching as it goes, but only last Friday I really got the nerve to do it. And then there I was, ready to go, but had no name for it. 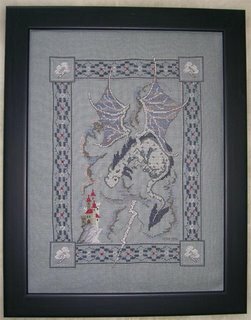 Then, of course there had to be some reverence for my passion (some might call it addiction) for cross stitch. Hmmm, I might be on to something there. SSS ... there might be a cute little alliteration in that. After some pondering (I think roughtly 5 seconds) the word 'Stanza' came to my mind. Hm, Stanza. Has something to do with poetry, I think. Wikipedia says: "In poetry, a stanza is a unit within a larger poem. (The term means "room" in Italian.) In modern poetry, the term is often equivalent with strophe; in popular vocal music, a stanza is typically referred to as a "verse" (as distinct from the refrain, or "chorus")." Well, this doesn't sound too bad and I hope you like it. I took Stormbringer with me on the road this week. I'm almost done - I'm on the membrane of the last wing (just filling it with Waterlilie 'Stormclouds') and actually did some backstitching on the lower part of the dragon already. If I push on, I think I might be able to finish it this weekend. Of course now I need to get a good frame and a mat for framing. There is a pretty good place in Dresden for the mat cutting (with a computer controlled mat cutting table that has me seriously drooling), so I probably will have the mat cut there. Just to find a nice frame. And decide on a place to hang it. I think I'm going to keep that one for myself and I do have the space, but still ... where? Of course, now is decision time. There are several candidats. For one there's Not Forgotten from Dragon Dreams. 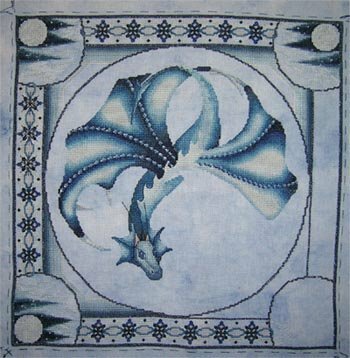 I've already did the kit up for all the specialty threads and also got the fabric, but I don't really need to do another Dragon Dream right now. Besides, I have about a dozend kits at home that I want to finish and they are really good for travelling projects as they already have everything in it. I've got two kits I'm thinking about especially, Mariner's Light and Voyage at Sea, both from the Petites Gold Collection by Dimensions. The fabric is aida, but I've bought some 36ct Edinburgh Linen I plan on swapping. I've done a couple of those Petites Golds already (Beautiful Bird and Eagles) and like the detail they show. Mariner's Light I bought twice already, giving the first kit away as a gift for a friend. After driving to Dresden this morning for a meeting here, I'm going to head out to Frankfurt/Oder in half an hour or so because I need support some work there tomorrow. Too much driving, but with the current audiobook of Harry Potter and the Prisoner of Askaban it won't be too bad (I hope) - it's about 2 1/2 hours drive, but I need to be careful not to miss my exits as I haven't done this route before. I do love audiobooks, and I've listened to all six of the Harry Potter books and Lord of the Rings (unabridged of course) at one time or another. They are great for stitching and for driving long distances. Yesterday I was listening to Harry Potter and the Sorcerer's Stone while sitting on the balcony and stitching on Midnight Hunting. I'm almost done with the border - maybe one more hour plus some straight stitches. I almost finished yesterday, but I was so tired, I couldn't quite focus anymore and as I had to go up early today, I decided to finish the border next weekend. For this week, I took Stormbringer from Dragon Dreams with me. It's been my travel project for the last couple of months and is about 85 to 90% done. With Midnight Hunting also fairly close to the end, there will be some happy dances soon. Hmmmm, we had our monthly Trekdinner (which was named after Star Trek at one point, but has practially nothing to do with that show anymore) in an Icecafe in Nackenheim (close to Mainz). The Dolce Vita has about 200 different ice cream creations and have special menues for Spaghetti Icecream (that is not that the icecream contains pasta, but that it's pressed through some kinda machine and it looks like spaghetti), Icecreams with Strawberries, Icecream with Yoghurt, with Chocolate and what not. I started as a good girl with a Yoghurt Cup with exotic fruits and no whipped cream (though, I have to admit, it didn't look too different from the one Gisela had, the Yoghurt Cup with normal fruit) But later I just couldn't resist ordering a second cup with Chocolate. *shrug* what can I say? It was goooooood. Good thing I don't do this too often - my scales wouldn't be too happy with me. I think this was one of the things I sort of missed while I was living in Dallas. The ice cream in the US is just not the incredible good icecream you can find here in Germany (or in Italy ... after all, most of the ice cafes here ar run by Italian). An don't have me started on frozen joghurt. There are world between that and some creamy, sweet, fruity ice cream. In the US they put stuff in ice cream that has no right to be there (like cookies) and far too much artifical flavors. What a wonderful morning it is. First time in some time the temps dip below 20 degrees, so finally everything cooled down a bit. I'm not against sun and sumer, but when it's too warm to sleep there the fun stops. I slept well last night, and except for a small headache I feel fine. Praise the dentist. I might be scared of them, but they do make the pain go away. So, now to the promised (or theatened) part where I talk a little bit more about myself. If you have noticed that my English is sometimes a little bit bumpy, and I use strange phrases or spellings (let alone the punctuation) I let you in into something. I'm not English, or American or any have other country affiliation were I would learn English from birth. I'm German - born here, grew up here, and basically plan on dying here someday in the far future with a book in one hand and my cross stitch stuff in the other. And, I also wasn't too fond of English in school. I scraped by, but that was about it. This all changed when I decided to go to evening school after I started working and get my high school diploma (or whatever the equivilant really is - here it's called 'Fachhochschulreife') I a) got an exellent teacher there and b) joined a group of back then Star Trek fans. I'm still in that group, but Star Trek hasn't been a topic in a looooooong time. By joining the group I started to realize that there a lot of interesting things out there in English and that this language could be FUN. I started reading, writing and watching all things English and today you find far more DVDs or videos or books in my home that are English than German. That I work in a company that is very international with the only common language being English certainly helps. Stitching: I've decided to put my big project that I'm doing for a friend's birthday and that I can't really talk about aside and go back to Midnight Hunting by Draoclair. I'm stitching the lower right corner and think I might have a shot at finishing the border this weekend. Last night when I got home the toothache I've had for a day or so got worse than ever. I slept maybe 2 hours tonight. So, first thing this morning was to head for my dentist. I've been there just two weeks ago, and everything was find - well, more or less fine, as we decided to schedule some dental work I've been pushing out for the last year or so. But that was on the left side, and it was the right side that was hurting. I thought my dentist would open at 8:00 AM, but actually he opens at 8:30, so I was waiting outside for half an hour for him to show up. And show up he did - only in his car, heading out. He had some seminar today and wasn't seeing any patients. He sent me through to his back up and after about an hour waiting I got my first shot against the pain and a trip to the x-ray. Another shot to numb the teeth further and the drilling started. A few minutes later the nerve was pulled, the hole was closed and the pain was still there in the background. With the prescription in my pocket I headed back to work. Okay, now to the more fun bit (or maybe not). I've started a blog. Yep, this is my very first post and certainly not really the way I wanted to start this. A few words to myself: I'm 40 years old, single and happily so. I work as an engineer in the semiconductor industry (where those computer chips are built, you know) I travel a lot for my company, mostly in Europe, but I've had a couple of trips to Japan (were my company's headquarter is) and the US. I still like to travel and been as far as New Zeeland (probably one of the most beautiful places I've every been) and Alaska (a friend of mine is living there). Else I love to read (mostly fantasy, but a good thriller now and then is okay, too) and I am additcted to cross stitching. I mean, really addicted. I do stitch a lot and hate it when I don't have to time to do so. I plan on blogging about this and that and maybe also a little bit of this as well.